Competing in Division 3 (small 4-year colleges and universities) of the awards contest, The Stylus brought home two of the biggest awards from the conference for the second year in a row — the Sweepstakes Award, given to the newspaper earning the most award points, and the Best Newspaper Award. The latter award required three issues of the newspaper to the submitted and judged on the overall quality of the writing, photography and design of the publication. 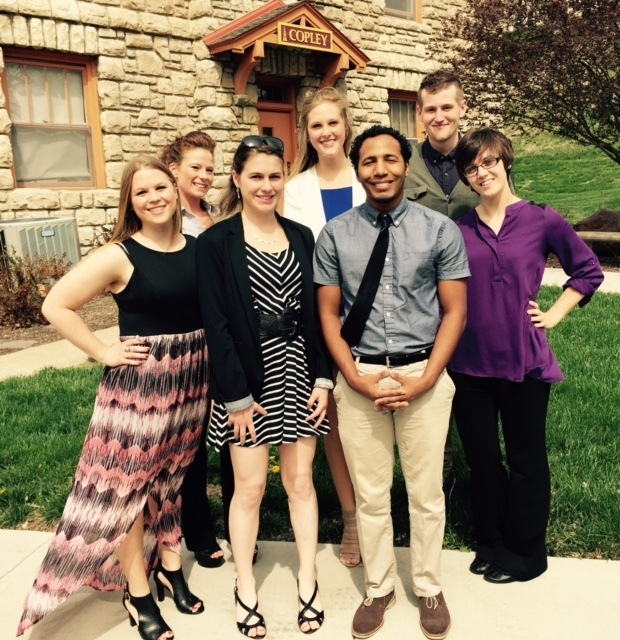 Submitted entries were from the Spring 2014 and Fall 2014 semesters. The Stylus’ adviser is Ashley Vasquez, adjunct instructor of communication arts. 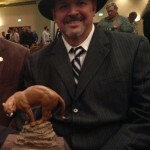 Kenneth L. Kieser, contributing writer for Northland Lifestyle magazine, was recently honored by the Conservation Federation of Missouri as their 2014 Conservation Communicator of the Year. Kieser was honored on March 31 by the Missouri House of Representatives with presentation of a proclamation honoring his career that has lasted over three decades. His work, both writing and photos, has appeared in most of America’s top outdoor magazines and numerous newspapers. Kieser was inducted into the National Fresh Water Fishing Hall of Fame in the Legendary Communicator 2010 class because of his fishing stories and work with mentally and physically challenged kids in fishing as well as with healthy kids. 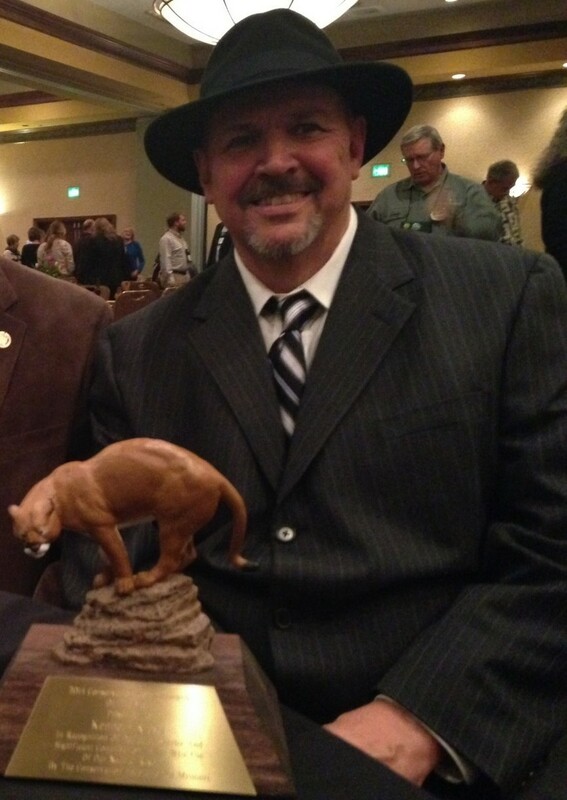 Kieser, was also inducted into the Missouri Waterfowler’s Hall of Fame on November 9, 2013. The Kansas City Royals honored Kieser’s work in kids fishing August 2, 2011, by allowing him to sit in the Buck O’Neil seat—a huge honor. 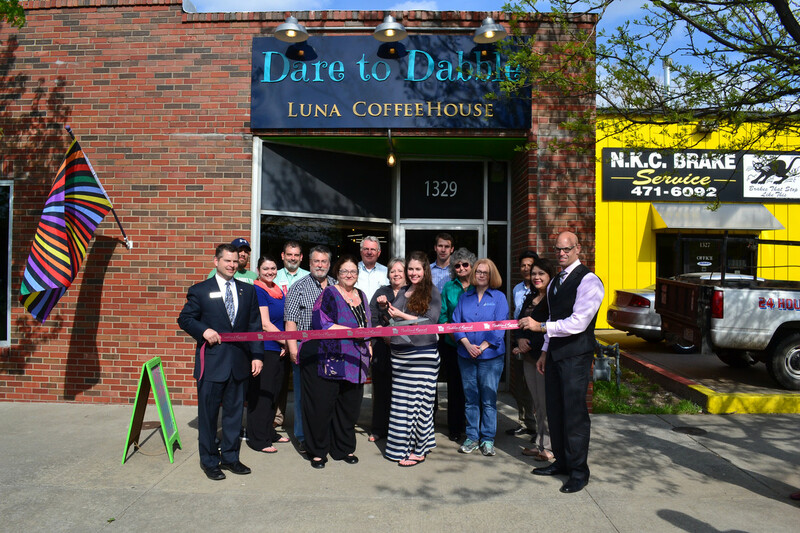 Surrounded by employees, customers and supporters, Dare to Dabble celebrated its new Northland location with a ribbon cutting ceremony on April 16. Housed at 1329 Swift Avenue, North Kansas City, the business showcased its new location in front of fellow Northland Regional Chamber of Commerce members. One of the newest NRCC members, Dare to Dabble is a brand new interactive art space in the Northland that offers open studios plus a variety of creative workshops for all ages. Christie Kizala of Kansas City, North was selected as the winner of the Freedom House “Grocery Grab” drawing at Cosentino’s Price Chopper, 9717 N. Ash, Kansas City on April 4. Kizala was the top pick among 10 finalists and two alternates. Kazala’s win earned her a five-minute shopping spree at the store. Each semi-finalist received a $25 gift card. The highlight of the morning event was Kizala’s sprint through Price Chopper. She was allowed one minute in the meat department and, though often overcome by laughter or the lingering shock of winning, she managed to grab several armloads of steak. She later noted her son, a high school student, would especially enjoy those. Store Director Lou DeMarco, a member of the Freedom House Board of Directors, initiated the event. Proceeds will be used to reduce utility expenses for the nonprofit organizations at Freedom House: Love INC, In as Much Ministry, Hillcrest Transitional Housing, Rebuilding Clay County and the Salvation Army. DeMarco and Board Chair Joe Crossett helped officiate at the event. When it comes to summer birds, many will immediately think of hummingbirds. Hummingbirds return form Central and South America in the latter part of April, a distance of over 600 miles. They will return to the same area where they were in prior years. Our area’s summer visitor is the ruby-throated hummingbird weighing in at 1/10th of an ounce. The male has a deep ruby-colored throat, while the female does not. They feed on nectar and insects, lapping up nectar with their tongues. You can make your own nectar by combining 4 parts water to 1 part white sugar. Boil the water and add the sugar. Make up enough nectar to keep the feeders filled with fresh nectar, as it should be changed every 3 days in hot weather. It stores over two weeks in the refrigerator. Do not add red coloring to the nectar. The Baltimore oriole and the orchard oriole usually arrive in late April and depart in mid to late August. They eat fruit and insects and will sometimes come to hummingbird feeders for nectar. Grape jelly and oranges are favorites. A good oriole feeder will have provisions for both. It is important to get their attention early in the season before they establish a feeding pattern. Although these bright orange and black birds are here in the summer most people do not see them as they don't come to traditional seed feeders. For more information call, or visit Wild Birds Unlimited Nature Shop at 816.415.4303. Nine seniors at St. Pius X High School earned the honor of Missouri Bright Flight Scholar by achieving an ACT or SAT score in the top 3 percent of all Missouri students taking those tests. These students included: Devin Chavez, Noah Essig, Brenden Hay, Sebastien Harmon, Andrew Hoog, Jackson Johannes, Caleb Kizzire, John Perlik and Joseph Ramsey. 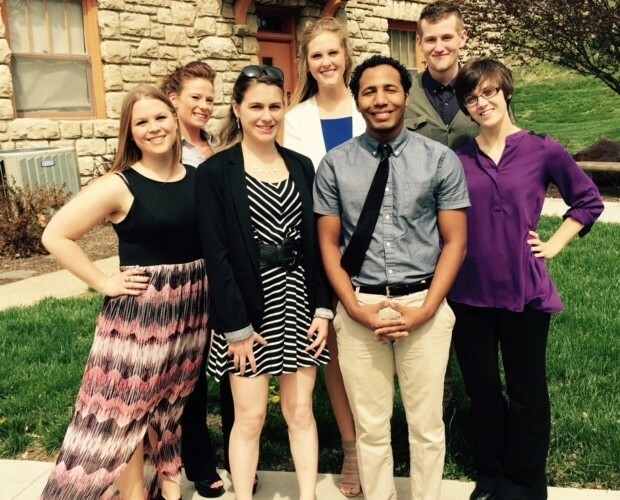 They will receive a $3,000 scholarship to attend a university in the state of Missouri. George Garrett, lead teacher of the Burlington YMCA Head Start program, was honored as one of the three 2015 Early Educator of the Year Awards, presented by Wonderscope Children’s Museum of Kansas City. Garrett, a Gladstone resident, recently celebrated 40 years as a Head Start teacher. He follows in the footsteps of his mother, who was also a Head Start teacher. 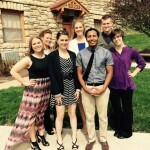 Garrett says, "I have had the unique experience of being the only positive male role model in many of my students' lives. My heart has been touched by students who ask me to be or call me their dad." The Early Educator of the Year Award, now in its second year, recognizes outstanding educators of children from birth to second grade in the Kansas City metropolitan area. Honorees are nominated by their colleagues and the families they serve. John Lowe, executive director, says, "Wonderscope considers teachers and early childhood professionals to be crucial partners in fulfilling our mission of sparking a lifelong love of learning through the power of play. We hope these awards will celebrate these unsung heroes in our community." 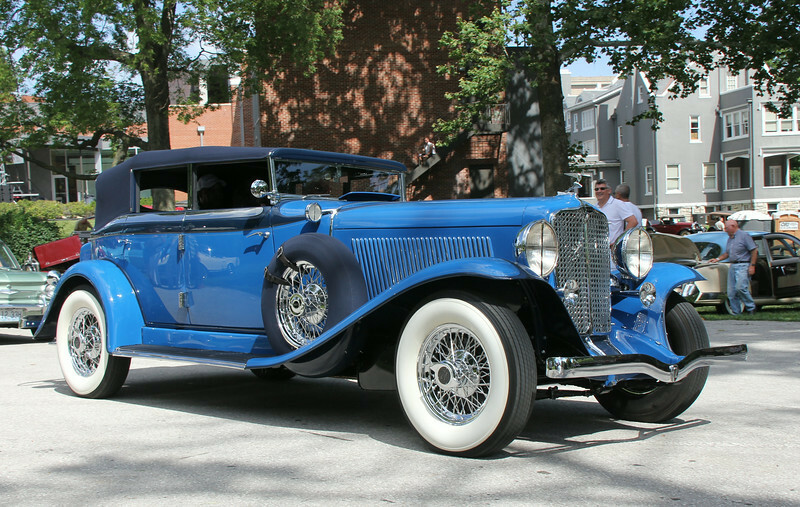 A presentation of 200 historically significant vehicles, including vintage and antique cars from throughout the country will be displayed at the Kansas City Art Institute for the Ninth Annual Art of the Car Concours. Trucks, motorcycles, sports and luxury cars, race cars, hot rods and pedal cars will be showcased. This year's event features concept cars that manufacturers built to gauge public acceptance of new technology and styling ideas, many of which found their way into production. The 50s and 60s became the Golden Age of the dream car. Proceeds benefit the KCAI scholarship fund. 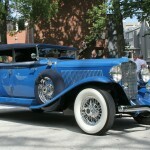 For more information about all the events or to purchase tickets, visit ArtOfTheCarconcours.com. The Liberty Hospital Specialty Clinic Shoal Creek, 9151 NE 81st Terrace, Suite 200, Kansas City, opened May 1 in the Barry Pointe building behind Gary Crossley Ford. Specialties offered at the clinic include cardiology, orthopedics, dermatology and obstetrics/gynecology. Cardiologists from Liberty Cardiovascular Specialists will have office hours five days per week in the new location. Liberty Orthopedics and Northland Obstetrics & Gynecology will offer specialist hours two days per week, and Dermatology & Skin Cancer Centers will be there one day per week.